Back at the start of the year WeCommunities held it’s own “Conference” – I put this in inverted commas as it was more like a get together (WeGetTogether) than a conference in the traditional sense of the word – anyway, I am diversifying slightly (nothing new there!) the point is that through the WeGetTogether I learnt so much about the art of the possible regarding social media and conferences. I have been to many conferences and witnessed so many more via Twitter and I feel that we have somewhat lost the plot when it comes to why we use social media during conferences. Useless information – eg Joe Blogs is now speaking …. Arrrggghhhhh !! We would love to know what he is saying !!! Believe it or not I could go on … isn’t it time that we put a little thought into this? Isn’t it time that we revisited the purpose of conferences? 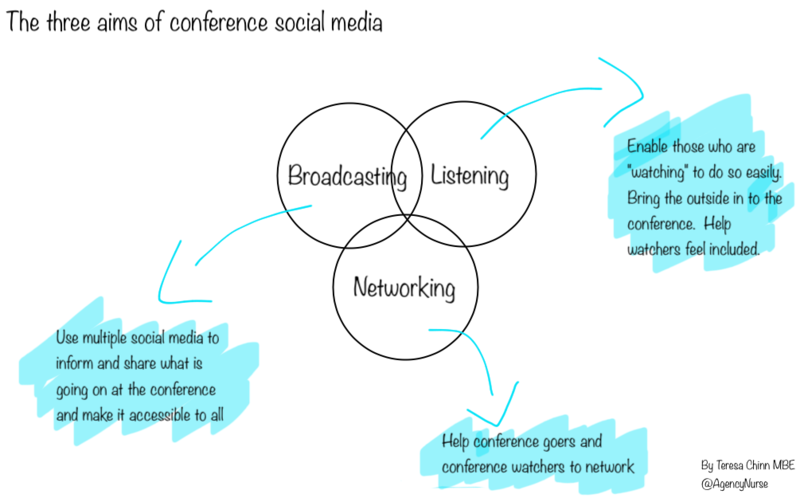 And the purpose of using social media at conferences? If we want to hold a conference to share information, to bring people together and to forward plan why on earth are we not putting more thought to the people who are outside of the four walls of our conference? Broadcasting / Taking the inside out – we used multiple social media including Twitter, Blogs, Vines and Periscope to engage people. We made our agenda short, sociable and shareable. We had student volunteers who Tweeted out informative and relevant tweets and were active role models for engaging. We held concurrent Twitter chats that sat alongside the agenda topics. We made sure that the hashtag was visible – on every slide and on all of the literature. We shared speakers Twitter handles. Listening / Bringing the outside in – We had people whose specific job was to listen to social media and feed points back into the room. We held Twitter chats and fed the main points back into the room. We had large and visible Twitter walls – that were uncensored. And, again, student volunteers really helped with listening to what was going on in social media and actively engaging. If you are holding a conference it is not longer acceptable to just create a hashtag. The social media part of the conference is as important as the conference itself – it spreads your message, it enables ideas from inside and outside of the room to be shared, it helps to make your audience feel valued (as opposed to the privileged few who can make the conference) and it enables both watchers and conference goers to network before, during and after the event. Doing social media well means ensuring that information and opportunities are accessible to all … it’s disappointing when all we see is a half-hearted hashtag with a stream of selfies! I think what you have identified here, Teresa, is that there are still many organisations which don’t get social media. They use it to broadcast most days, and when they have a conference they just up the quota of broadcasts.